Mood Collections are pleased to be able to offer FREE delivery to all UK mainland addresses (excluding Channel Islands and Republic of Ireland). Delivery outside of these areas can be arranged with prior agreement. The following postcodes are classed as Non-Mainland UK or Remote/Rural delivery: AB, IV, KW, PA, PH, HS, KA, ZE, PO30-PO41, IM, JE, GY, BT, TR21-TR25. Please contact us by email customerservice@moodcollections.co.uk or call 0203 826 6212 to discuss your requirements and receive a quote for delivery to non-UK mainland addresses. *The delivery times we provide are given in good faith, for more details on our delivery and returns please read our terms and conditions. We are unable to dispatch or deliver orders during public and bank holidays. If you have not received your order after 4 working days from dispatch, you will need to contact us as soon as possible so that we can contact the courier. In the unlikely occurrence of a product being out of stock, we shall inform you as soon as possible by contacting you by telephone or email. 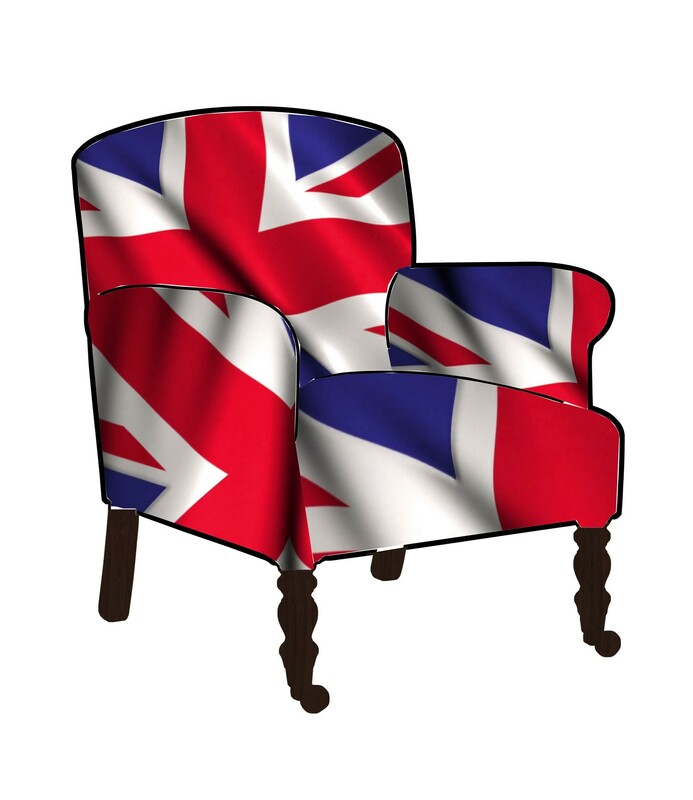 Standard Delivery to mainland UK is free on bedlinen, bedding cushions, throws, lighting, and accessories. 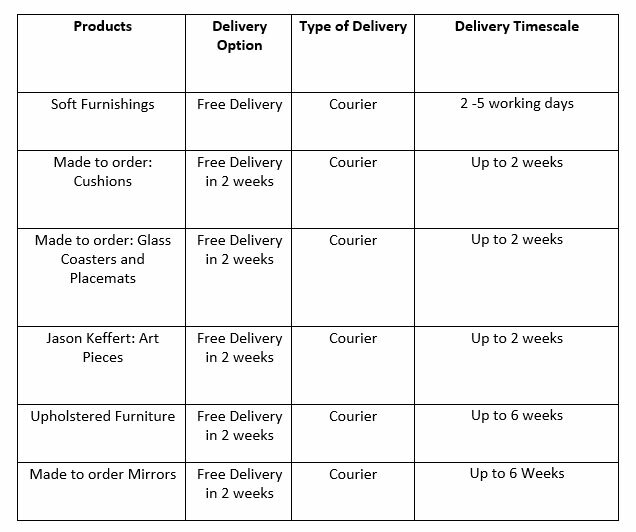 Delivery of soft furnishings accessories will be undertaken by our courier service or, if ordered alongside furniture and/or mirrors, they will be delivered as part of one single free delivery along with your larger items via either our 1- or 2-man delivery service. If you have multiple items on your order and require smaller, stock items in a shorter timeframe, please contact us and we will arrange for a courier delivery of the items for an additional delivery charge of £5.95. If your items exceed the courier weight and size limits or they need to be packed in more than one box, you will incur a further £5.95 delivery charge to split the delivery. You have 14 days to notify us of your intention to return unwanted accessories, this includes but is not limited to stock occasional furniture, lighting, mirrors, cushions, throws, home décor and bed linen. Unless faulty, we expect all items returned for a refund to be returned to us at your cost, unused, unopened in their original packaging and in a fully sellable condition. Please return items on a tracked delivery service with enough insurance to cover you in case of loss by the carrier as these products are owned by you. If an item is faulty, please notify us within 3 days of receipt by emailing returns@moodcollections.co.uk, providing us with your name, order number, details of the problem with the product, your contact details and a clear photograph/s of the fault. One of our customer service team will contact you within 5 workings days to discuss and resolve the issue. If you have changed your mind you can return your items by emailing returns@moodcollections.co.uk to notify us. We will provide you with further details of where to return your item(s). Please take a photo of your item as proof of condition prior to sending and then ensure that you package the items appropriately to safeguard against damage occurring in transit. The delivery cost will be covered by you, the customer, and we ask that you send it back via a tracked delivery service to cover you in the event of loss by the carrier. If you wish to purchase another item instead, please place a new order. Once the goods are received and are confirmed to be unused, unopened and in their original packaging, we will issue the refund. Please allow up to 14 working days to process your refund once the goods have been received by us, the refund will take up to 14 working days after this to be debited to your account. We aim to deliver within 6 weeks of your order being placed. While every effort is made to meet this timeframe, delays can occur that are beyond our control. Where this happens, we will make you aware as soon as possible and will give you the option to proceed with the order, change your order or cancel the order for a full refund. For orders of a singular upholstered furniture item (excluding headboards and footstools) and orders with multiple items that include upholstered furniture, mirrors and occasional furniture, we will book in our 2-man delivery service. Our 2-man delivery service is included n the cost anywhere within mainland UK. Once your items are ready our delivery partner will send you a text message inviting you to book your delivery online from a selection of available delivery slots. If you have not booked your delivery within 24 hours, our delivery partner will call you to arrange delivery. You will be sent a text and email message to confirm your booking. You will receive a 2-hour delivery time slot the day before your delivery is due via text message and email. Our delivery partners will arrange delivery of your goods with you personally and do their best to accommodate specific requirements, special requirements will be completed at an additional charge, paid directly by you, to our delivery partner. Our mainland UK 2-man delivery service covers mainland UK only, based on delivery in our standard size vehicles. For deliveries, north of Glasgow and Edinburgh there will be a charge of £40, payable to the delivery company before your delivery can be booked. Deliveries outside of mainland UK in the Highlands and Islands will attract an additional delivery charge, this applies to Scottish postcodes: HS, IV 16-28, IV 40-63, KA 27-28, KW, PA 20-78, PH 15-50, ZE; plus, delivery to the Isle of Wight, The Isle of Man, The Scilly Isles and The Channel Islands. Further information on delivery charges is available upon request. Please contact customerservices@moodcollections.co.uk with your order and address details and we will be happy to quote. The delivery charge will need to be paid in full prior to your items being made. Delay in payment will result in your order being delayed or not going through. Deliveries that require a small van for access will attract a special charge regardless of any promotion at the time of purchase and must be requested at the point of ordering. It is your responsibility to ensure you make us aware of any restrictions which will affect your order being delivered to a room within your property. This includes, but is not limited to, door dimensions, staircases, and lifts. If we are unable to deliver your order due to access restrictions which you have not made us aware of the goods will be returned and refunded, however, you will still be liable for a £110 delivery charge and we reserve the right to make a deduction to cover our re-stocking costs. We require 48 hours’ notice for cancellation of delivery to avoid further charges being applied and if you are not at the property for a pre-arranged delivery, a re-delivery charge of £110 will be payable before a new date can be booked. If no delivery date is re-booked, we will store the products at a cost of £50 per week until such time as the payment you have made does not cover the storage costs any more or for a period of 4 weeks, whichever is sooner. Our standard delivery includes delivery to a room of choice with unpacking and removal of all packaging materials with a basic assembly including beds (maximum 20-minute assembly time is allocated for your delivery). This does not include hanging of mirrors. Your room of choice and access to it must be clear with enough space to work in. If there is insufficient access or the room is not clear, our delivery partner will not be able to provide the basic assembly service. In this instance, our delivery partner will try and take the items out for you to inspect them and remove any packaging. Any damage to the products must be reported at this time. Failure to do so will mean that we cannot entertain any claims for this later. Our delivery partner cannot move or dismantle existing furniture. Please do not dispose of your old bed until your new one arrives. If you do dispose of your old bed prior to your bed being delivered, we will not be accountable or responsible for any costs incurred for you to remedy the situation. We cannot drill into your walls to attach fixings such as, but not limited to, wall mounted headboards, mirrors and wall straps on storage units, etc. On receipt of your products from our 2-man delivery service, it is important that you fully check that all items are in good condition before our delivery partners leave your home. The items will be fully unpacked, and packaging removed to allow you to check your item. You will be asked to sign to confirm that you are happy with your furniture. In the unlikely event that a fault is discovered, you should notify our delivery partners at the time of delivery or if the fault is noticed after delivery, please notify us as soon as possible, within 3 working days. If a fault becomes apparent within the first 14 days of delivery, you must notify us within a reasonable time as soon as you notice the fault, by emailing your name, order number, address, contact phone number, details of the issue and clear photographs as proof to customerservice@moodcollections.co.uk. One of our team will be in touch as soon as possible, we will aim to contact you within 5 working days, if you have not heard within this time frame, please re-send your request or call us. Please do not send anything back without a Returns Note Number as any returns sent outside this scope will not be processed and will be disposed of and no credit will be issued. On receipt of your headboard, footstool, mirror or occasional furniture from our 1-man delivery service, it is important that you fully check your items as soon as possible after your delivery. In the unlikely event that a fault is discovered, you should notify us as soon as possible, within 3 working days. For more information on how to get in touch with us and the procedure for returning an item, including the necessity for a Returns Note Number prior to sending anything back to us. If the product for collection is under the retail value of £110, you will be contacted to pay the difference and your collection will only be organised once we have received payment of the difference in cost. A refund will be given, minus any collection charges, where applicable, on receipt of goods by us, provided the goods are undamaged and packed within the original packaging. If your packaging was removed during your original delivery, new packaging will be provided by our delivery partners. Please ensure that you take clear photos of your purchase prior to collection as proof of return condition. In the unlikely case of any damage dispute, we will request that you send you photos via email as proof that there was no fault prior to collection. This does not apply to goods purchased from clearance or ex-display. All refunds must be made to the original method of payment. We will not refund delivery charges where applicable. All orders must be delivered to your home within 2 weeks of you being contacted to arrange delivery. A non-refundable fee of £50 per week will be charged where we have been unable to agree on a delivery date with you, within the 2-week period. If after ordering you find that you can no longer take delivery of your items within the 6-week time frame, please make us aware ASAP (within 2 weeks) of ordering and we will arrange to hold back your order to meet your required delivery timeframe. Orders that remain undelivered for a period of either 8 weeks after you have been contacted to arrange delivery or until the payment you have made to us no longer covers the storage charges, whichever is sooner, are liable to cancellation. We reserve the right to retain 50% of the order value plus any accrued storage fees.